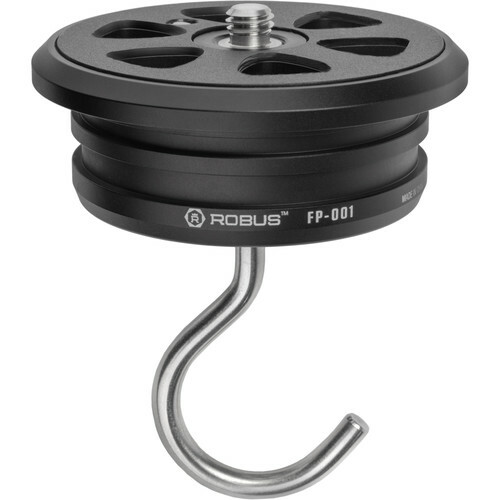 The replacement FP-001 Flat Plate for Vantage Series 3 and 5 Tripods from Robus is compatible with the RC-5558, RC-5570, RC-8860, and RC-8880. The machined aluminum plate fits firmly into the yoke of any of these tripods. Ball, gimbal, or video heads without a video bowl mount to the plate's 3/8"-16 threaded mount and are held securely in place with a set screw. A camera bag or sand bag can be hung from the counterweight hook, which is located on the bottom of the plate, to add weight and further stabilize a tripod while using it in windy or inclement weather. The CNC-machined aluminum flat plate fits firmly into the yoke and locks into place. The integrated set screw tightens against the bottom of the head to securely hold it in place. A camera bag or sand bag can be hung from the counterweight hook, which is located on the bottom of the plate, to add weight and further stabilize a tripod while using it in windy conditions or inclement weather. Box Dimensions (LxWxH) 4.0 x 3.85 x 3.0"